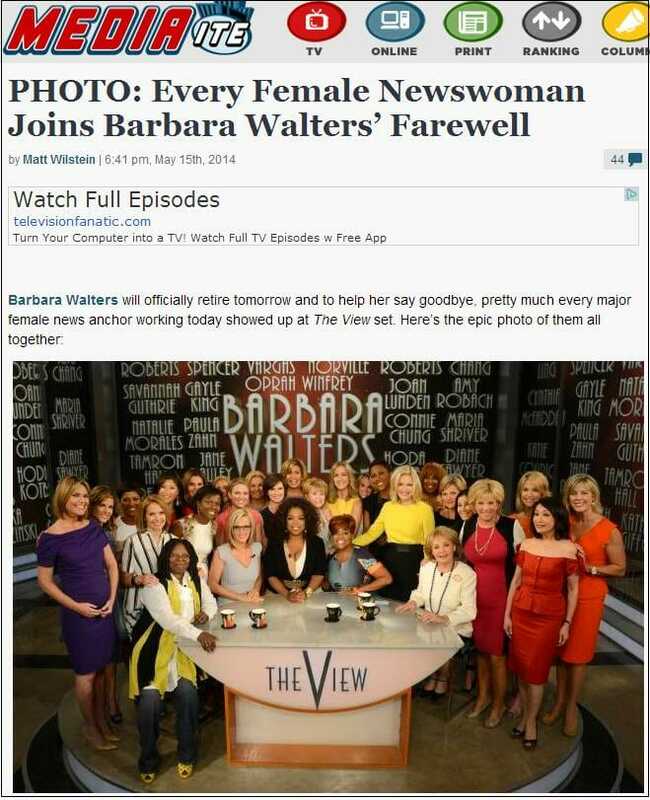 It was Barbara Walters last day on “The View” on Friday and several female reporters joined Walters on stage for her last show. Mediaite reported: The group spanned generations as well as networks and included such major names as Oprah Winfrey, Katie Couric, Connie Chung, Gayle King, Maria Shriver, Jane Pauley, Savannah Guthrie, Tamron Hall, Diane Sawyer, Robin Roberts and more. But, one prominent group of female reporters were conspicuously missing – the FOX News reporters. Three of the prominent FOX News females: Kimberly Guilfoyle, Jamie Colby and Megyn Kelly. Megyn Kelly has one of the top shows on cable news. Greta Van Susteren has had one of the most watched cable news shows for years. Gretchen Carlson has her own afternoon show. For some reason the FOX News personalities were overlooked or not invited.